For over 50 years, Derrick Building Solutions has been a friendly and reliable choice for construction projects throughout Minnesota and Wisconsin. Derrick Building Solutions was built from the ground up; beginning in a farm house basement and growing into the business it is today. As a family owned company, hard work and close relationships with their customers are always at the core of every construction project. The staff believe nothing beats top quality and that shines through the projects they created through the years. Whether someone is looking for an office renovation or a complete building design and construction, Derrick Building Solutions can deliver! Our Vision Design team worked with Derrick Building Solutions to update their old website and create a stunning new look. 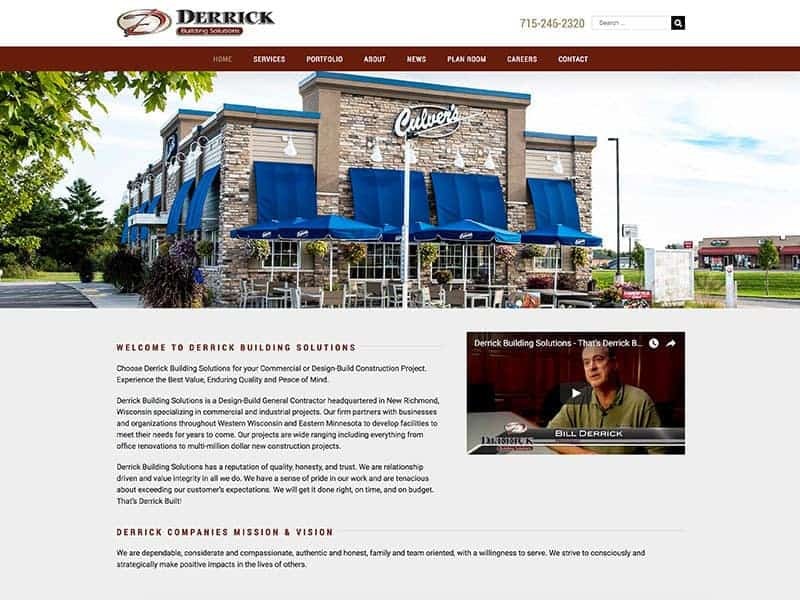 As is the case with many companies we work with, Derrick Building Solutions had kept their company information up-to-date on their website and wanted decided it was time the website design mirrored the company’s growth. By upgrading the website to a WordPress platform, it will be much easier for staff to make updates and add information as needed. Our team redesigned the website to include mobile capabilities, added a sleek menu bar, and updated the company’s logo. With the new updates, the website compliments the company’s personality and values very well. Check out the updated website here! Updating your website is like buying a new office chair; you will wonder why you didn’t do it sooner. Contact us today to get started!